The main cause of disease of the gallbladder and biliary tract is gallstones. The structure, formation and function of bile. Gallstones are present in 10-20% of the population in the Western Hemisphere, but the exact prevalence is unknown. There is a geographical variation. Gallstones are rare in the Far East and Africa and very common in native North Americans and in Chile and Sweden. They occur twice as frequently in young women than in men but this difference decreases with increasing age. Gallstones can be divided into those composed of cholesterol and those composed of bile pigment. Cholesterol stones, which account for 80% of all gallstones in the Western Hemisphere, contain more than 70% cholesterol, often with some bile pigment and calcium (mixed stones). Pure cholesterol stones are often solitary. Cholesterol is partly derived from dietary sources. In addition, it is synthesized, chiefly in the liver, but also in the small intestine, skin and adrenals. The rate-limiting step in cholesterol synthesis is J3-hydroxy-J3- methyl-glutaryl- CoA (HMG-CoA) reductase, which catalyses the first step, i.e. the conversion of acetate to mevalonate. The cholesterol forme is cosecreted with phospholipids into the biliary caniliculus as unilamellar vesicles. Cholesterol stones only develop in bile that has an excess of cholesterol relative to bile salts and phospholipids (supersaturated bile). This could occur because of excess of cholesterol or because of a decrease in bile salts. There is a reduced bile salt pool in some patients with cholesterol gallstones and the pool circulates more frequently. This may account for the reduction in the ratelimiting cholesterol-7a-hydroxylase found in some patients (feedback inhibition). Diminished bile salt synthesis is not the only cause of supersaturated bile; there appears to be an increase in HMG-CoA reductase with an increase in cholesterol secretion into bile in some patients. In supersaturated bile the bile acids solubilize phospholipids from the unilamellar vesicles more than cholesterol. 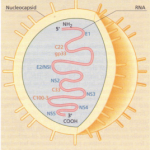 This results in unstable vesicles which are more prone to aggregate, fuse and form multilamellar vesicles. It is from these vesicles that cholesterol crystals nucleate. Factors other than cholesterol saturation are required to form gallstones, as supersaturated bile is found in normal subjects during an overnight fast. The rate of cholesterol crystallization and gallbladder function also play a role. Glycoproteins in bile promote nucleation of cholesterol crystals, leading to stone formation, but why this occurs only in bile from patients with gallstones is unclear. It may depend on the presence or absence of solubilizing factors. The role of infection is unknown. 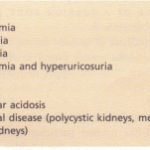 Definite risk factors for gallstones. Black pigment stones contain calcium salts of bilirubin, phosphate and carbonate in addition to bilirubin polymers and mucin glycoproteins. The biliary lipids are normal. 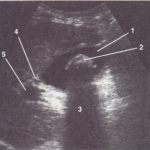 These stones form in the gallbladder and are seen in patients with chronic haemolysis, e.g. hereditary spherocytosis and sickle cell disease, where there is an increase in bilirubin, and also in cirrhosis. In other situations the pathogenesis is unclear. Brown pigment stones have layers of cholesterol, calcium salts of fatty acids (mainly palmitate) and calcium bilirubinate. They tend to form in the common bile duct after cholecystectomy and are due to precipitation of bilirubin with calcium. They are also found with strictures, sclerosing cholangitis and Caroli’s syndrome. In the Far East these stones are associated with parasitic infestation of the biliary tract. The majority of gallstones (approximately 80%) remain in the gall bladder and are asymptomatic. A gallstone may impact in the neck of the gallbladder or in the cystic duct, giving biliary pain or acute cholecystitis. Finally, gallstones may pass into the common bile duct, giving rise to biliary obstruction that produces severe biliary pain and sometimes cholestatic jaundice. Bacterial infection can occur and produce cholangitis. Clinically the type of pain is similar in the above situation. It occurs in the epigastrium and right hypochondrium and is not colicky. Biliary ‘colic’ therefore is a misnomer. Rarely a gallstone may perforate through the wall of an inflamed gallbladder into the intestine, producing a fistula. Gallstones do not give rise to any other symptom complex, and the idea that they produce indigestion, chronic right hypochondrial pain or intolerance to fatty food is based on a false correlation. Gallstones and upper abdominal symptoms are both common, so great care must be taken to establish that the two are truly related. Fair, fat, fertile females of 40 years of age have the same chance of having gallstones as the rest of the general population (10-20%). Thus, if they are investigated regardless of symptoms, gallstones will obviously be seen frequently by chance alone. In over 90% of cases the gallbladder contains gallstones. Initially there is obstruction to the neck of the gallbladder or the cystic duct by an impacted stone, leading to distension and inflammation. The inflammation is usually sterile, but within 24 hours gut organisms can be cultured from the gallbladder. Occasionally the inflammation may be mild and quickly subsides, sometimes leaving a gallbladder distended by mucus (mucocele). In this situation the patient may only have slight abdominal pain with a palpable gallbladder. More commonly, however, the inflammation is more severe, involving the whole wall and giving rise to localized peritonitis and acute pain. Occasionally the gallbladder can become distended by pus (an empyema) and rarely an acute gangrenous cholecystitis occurs with perforation and a more generalized peritonitis. The disease can occur at any age. The main symptoms are severe pain in the epigastrium and right hypochondrium. The pain is continuous, increasing in intensity over 24 hours. It can radiate to the back and shoulder. It may be accompanied by nausea and vomiting. Mild jaundice occurs in 20% of cases owing to accompanying common duct stones or to surrounding oedema occluding the common hepatic duct . 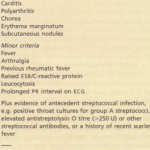 The patient is usually ill with a fever and shallow respirations. Right hypochondrial tenderness is present, being worse on inspiration (Murphy’s sign). There is guarding and rebound tenderness. 1 Blood count. A moderate leucocytosis is found. 2 Biochemistry. The serum bilirubin, alkaline phosphatase and AST may be slightly raised. 4 HIDA scintiscan. 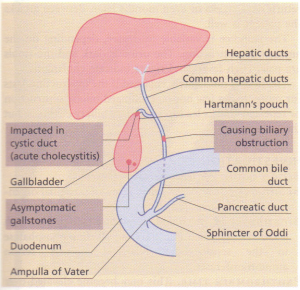 This is valuable and shows blockageof the cystic duct with the bile duct, but not the gallbladder, being visualized. Ultrasound and HIDA scintiscans have a similar accuracy and the technique performed will depend on local facilities. S X-ray. A plain abdominal X-ray shows gallstones III 10% of cases; this is not useful diagnostically. The differential diagnosis includes other abdominal emergencies, such as a perforated peptic ulcer, retrocaecal appendicitis and acute pancreatitis. Right basal pneumonia and myocardial infarction must also be considered. The majority of patients improve with conservative management consisting of bed rest, nil by mouth and intravenous fluids, with the addition of an antibiotic, usually amoxycillin or a cephalosporin. In all but the mild cases, pain relief with an opiate is required. 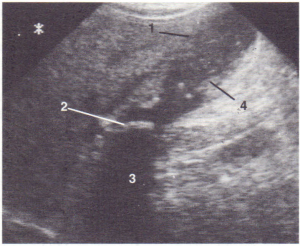 Ultrasound showing acute cholecystitis with impacted stone. Note distension of gallbladder with thickened wall and sludge. In the absence of vomiting, the patient can soon tolerate oral fluids and nasogastric aspiration is not often required. Signs of complications such as generalized peritonitis or gangrene of the gallbladder (which causes increasing pain and fever) are an indication for urgent surgery, particularly in the elderly. Cholecystectomy (see below) within days of the acute attack has been advocated for all patients who are not an anaesthetic risk. A firm diagnosis can usually be made using an HIDA scan or ultrasound. Alternatively, cholecystectomy can be performed 2-3 months later. However early surgery means only one hospital visit and no possibility of a recurrent attack while waiting for surgery to be performed. It does not increase operative morbidity or mortality and is, therefore, the recommended treatment.